Ajax search pro is the best live search engine plugin for WordPress. Highly customizable, with many features and options, giving the best results possible! Replace the WordPress search bar with a better looking, more efficient search engine. Looking for a better WordPress search? Check out this search plugins features, including checkbox, dropdown, radio button category filters and custom field (post meta) filters as well. Shortcodes and widgets compatible with page builders, such as: Elementor, WPBakery Page builder (and Visual Composer), Divi Page Builder and others..
Ajax Search Pro for WordPress was designed to boost the user search experience to the maximum. It provides a live ajax search, which makes the wordpress search experience more confortable. The results are presented with images (if any found), so they look more attractive and less flat. The search works with mobile devices, let it be Android or IOS powered. The search can override the default wordpress search results – so the ajax functionality is extended – replace your default theme search with only a click of a button. The search can return posts, pages, any custom post types (like WooCommerce products, BBPress forums, topics, replies), categories, custom taxonomy terms (like product categories, portfolio tags), users, BudddyPress groups and BuddyPress activities as results. Searching media attachments, including their content is also possible – for PDF, CSV, TXT, RTF and Office documents, Excel and Powerpoint files. More than 60 colorful, fully customizable themes will save you time with the CSS hussle, so you can focus more on the presentation. The backend offers hundreds of options for those, who like to customize the search to the maximum. Many features were implemented based on customer feedbacks, and even more coming soon. This WordPress search plugin officially supports Visual Composer as well – so in addition an Ajax Search Pro Visual Composer addon is included within the plugin. Live results page loader script also included – for more details, check out the Results page live loader documentation. The plugin is updated regulary based on customer feedbacks and bug reports. Every support ticket is answered within 48 hours, usually in 12 hours (except for weekends). The search features an easy to use drag and drop style taxonomy and custom field filter builder. Checkbox, radio, select dropdown, mutliselect and date filter types are all supported. 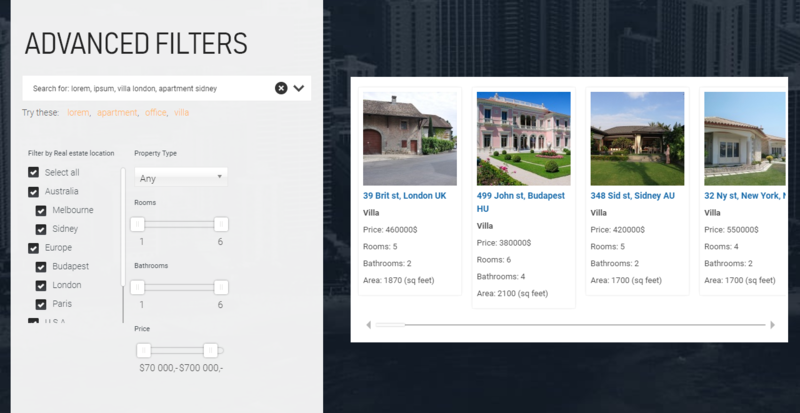 Fully intuitive editor for all major and minor details – including ordering, selected items, parent-child relationships, layout modes and connection logics as well. Over 400 other back-end options will give you the tool to make a fully functional and useful wordpress search form for your website. The search supports posts, pages and any kind of custom post type. WooCommerce, Jigoshop, wp-Ecommerce and many other plugins use custom post types – so they are all compatible with Ajax Search Pro. Four built-in layouts: Vertical, Horizontal, Polaroid and Isotopic. 60+ pre-defined theme for each layout, including the ones on the demo page. Three different widget are provided (latest searches, top searches and search box) and two shortcodes for each search. Shortcode buttons are also visible on the post editor. The search has built in libraries with extreme compatibility for image handling. They can parse through content, excerpt, custom fields or just simply display the featured image. Use the variety of high resolution, vectorized and colorizable svg icons or upload your own if you want to. You can change the search logic to fit your needs. By default the plugin works with an OR logic to provide higher amount of results. If you however need more strict results, you can change this with a click. More info in the documentation search logic section. Highly adjustable image parser ensures to show the best quality images in the results. The plugin can scan the featured, content, excerpt custom field for images. Create and manage category, tag and any taxonomy term filters. Checkboxes, drop-downs and radio button layouts are all supported. For even more sophisticated layout you can create custom field filters, to give your users more advanded ways to search your content. Having a multisite network? You can select which blogs you want to include in each individual search instance. You can search multiple blogs at the same time. A fully configurabe relevance options panel is provided for those, who like to fine-tune their plugins. You can switch to index table search and create indexes for even more relevant results. Shortcodes and widgets compatible with page builders, such as: Elementor, WPBakery Page builder (and Visual Composer), Divi Page Builder and others.. The plugin also acts as a Visual Composer and WPBakery Page builder add-on as well. No place on your site for the search widget? You can hide the search bar until the user clicks on the magnifier icon. Google keyword suggestions and autocomplete is enabled by default. The suggestions language is changeable. The search phrase can be highlighted in the results list. You can change the color of the highlighting as well. Plugin version 4.5 introduces a new, index table powered search engine. This engine is capable of indexing shortcode content, for sites built with composer plugins. It’s also a huge performance saver for high traffic sites. 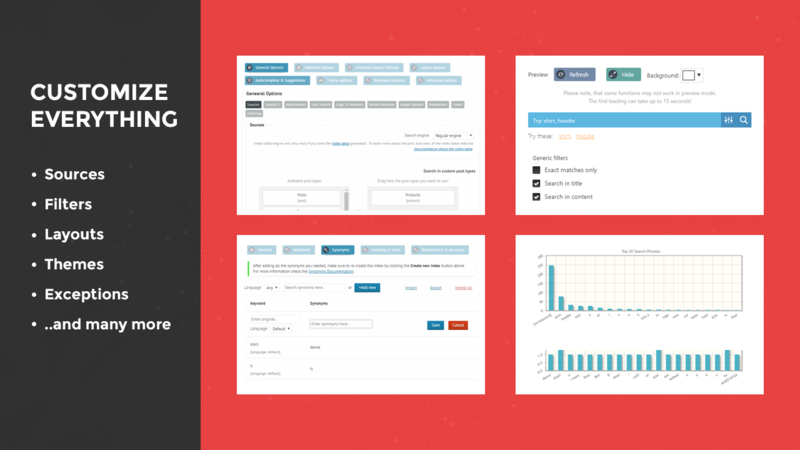 Track the search query performances with the simple, built in performance tracker. It will help you optimize the search ajax speed. By enabling the search statistics will give you an insight on which phrases are the most popular on your website. With a push of a button you can integrate google analytics to the search, so the phrases will show up as pageviews on your analytics dashboard. For websites with higher traffic caching is provided to reduce the database queries and increase the search performance. Compatibility options will provide you a quick fix interface in case something is not working properly. The plugin will track the query performances and give you a better insight on your recent setting changes. Want to use a working search instance on your other project? Export the search settings and import them to your other site. Easy as that. We are taking customer support very seriously. You can expect a reply within 24 hours during workdays. To open a support ticket, go to this link. Will the plugin work with the * theme? Yes it will. The plugin is theme independent. Is it compatible with Elementor, Divi Page builder, WPBakery Page builder etc..? Yes it is. The plugin shortcodes can be used within the corresponding page builder element. Will it work on a multisite blog? Can it replace my default theme search bar automatically? Yes it can! You can select which search instance you want to display instead of the default theme search bar. Can I search custom post types, like WooCommerce/Jigoshop products? Can I search buddypress groups/activity-feed/users? Can the plugin return categories or custom taxonomy terms as results? Will it work with bigger databases, like 25000+ records? Yes it will. The search speed only depends on your server speed. Does it support sites with RTL? Will it display images, that are not hosted on my server? Yes it will. In case of issues, read this knowledge base article. Is support provided, if so where can I get supported? Yes, this item is supported! Please read the documentation and the knowledge base first. Many questions are answered there. Can I search attachments and their contents on my server? Yes, indexing and searching Text, PDF, RTF, CSV, Office docx, Excel and Powerpoint file contents is possible. More information in Attachment content search documentation. Check the full changelog here. 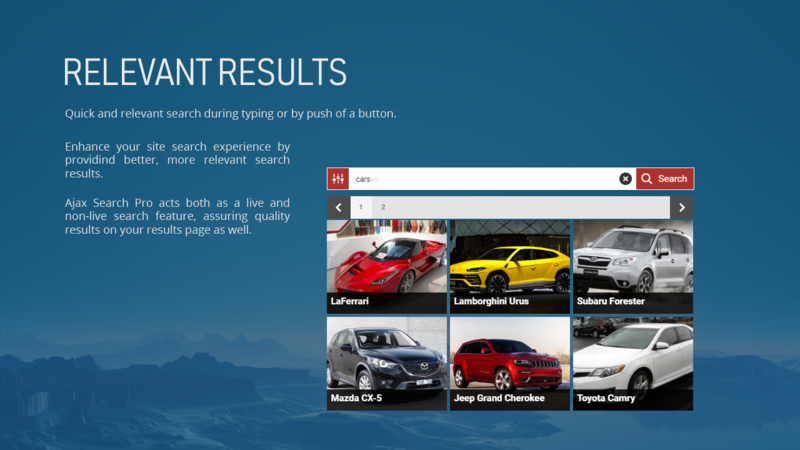 User search is now possible! Attachment search is now possible! Individual result groups (terms, posts, buddypress results, etc..) can be ordered now. The plugin can now override (replace) the default WordPress search results on the results page! 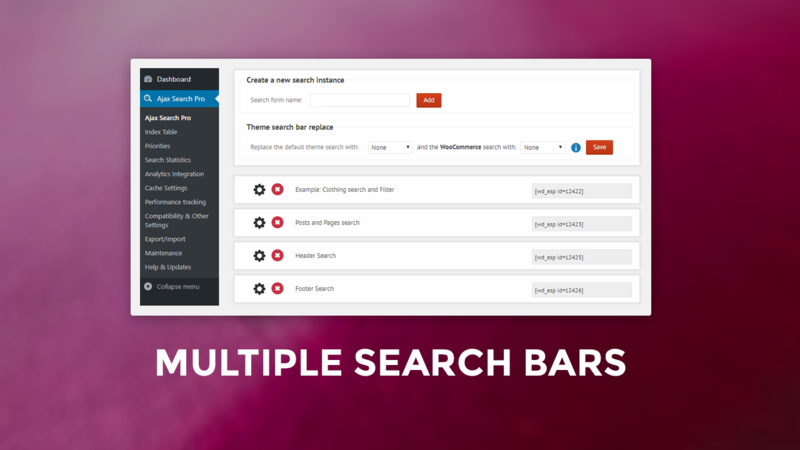 Multiple search plugins on one page – You can configure all of them separately! Search in public custom fields is now possible! 2 New widgets: Latest searched keywords and Top searched keywords! – You can setup a sidebar widget of the latest/top used keywords and even trigger a search by clicking on them! For the full list see the changelog down below! Custom Post Types support – You can select which post types do you want to search! Tested with BBPress! Search autocomplete with search statistics or google keywords! Post grouping by category or post type! It’s possible to exclude categories or posts from the search! Indexing titles, content, excerpt, custom fields, author, categories, tags, taxonomy terms etc..
Automatic and WP_Cron based indexing included. By default the plugin uses the Regular search engine, but you can change it anytime on the search General Options page. Check the index table engine section of the documentation for more information about the index table engine. You don’t need to worry about touching the code and loosing all the changes with upgrades. The search is packed with hooks for the most convenient access. (the lists are located at the action.txt and filters.txt files as well as in the documentation) No frustration = faster coding. Check out our other products as well!